+39 0434 1696106 (Mon-Fri) or email! PlaneWave CDK500 f/6.8 complete telescope includes CDK20 tube, the 20 inch (508mm) f/6.8 Corrected Dall-Kirkham astrograph and L-500 mount, the direct drive model of the L-Series. 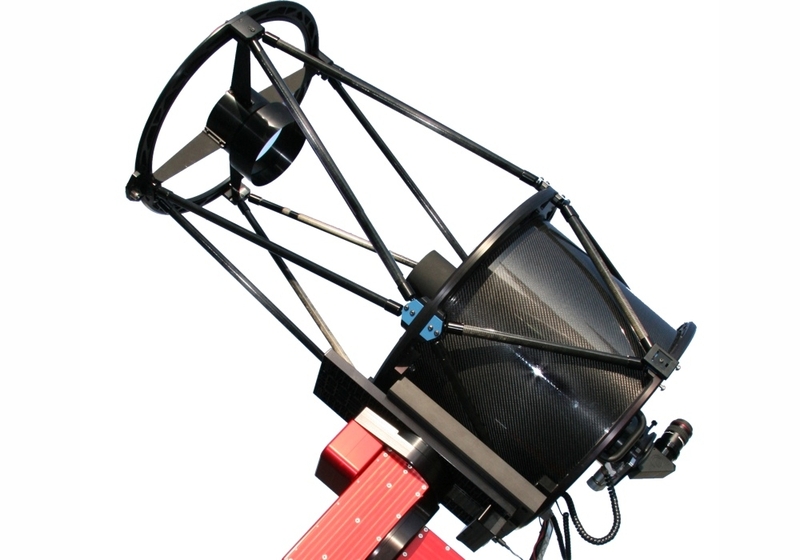 This way PlaneWave combines its revolutionary optical systems with its brand new innovative L-Series direct drive mount that sets a new standard for small observatory telescopes. For optional accessories and telescope delivery time, please contact us. The CDK (Corrected Dall-Kirkham) Optical Design is an innovative solution for unsurpassed astroimaging quality at an affordable price. The CDK telescope design provides excellent imaging with large format CCD cameras while remaining superb for visual use. The CDK design far exceeds the off-axis performance of most commercial telescope designs including the Ritchey-Chrétien design. This no-compromise design is unique in making the optical alignment forgiving and collimation very easy. This guarantees the user the best possible performance from the telescope. The end result at the image plane of the CDK design is no off-axis coma, no off-axis astigmatism, perfectly flat field (no off-axis defocus). The CDK design will give you pinpoint stars from the center to the corner of the field of view. The L-Series combines versatility, simplicity and affordability by combining all the technology of observatory class telescopes into a compact stand-alone mount. In its Alt/Az configuration it is considerably more compact than its equatorial counterpart, allowing a larger telescope to fit in a smaller enclosure. Unlike German Equatorial mounts, there are no meridian flips to deal with, and no large protruding counterweights to create a dangerous hazard in a public observatory. Alt/Az is more intuitive to use and no polar alignment is needed. Besides, it is the way the pros do it! © 2013-2018 PrimaLuceLab iSrl, via Roveredo 20 / b 33170 Pordenone. VAT IT01736450931. All rights reserved, reproduction prohibited, even partial. Information and conditions subject to change without notice.